This week we have a review of the latest Basset Hound mystery by Sue Owns Wright, Ears For Murder. We also have a fun interview with Sue. Details at the end of this post on how to enter to win a copy of Ears For Murder, and a link to purchase it from Amazon, and an indie bookstore where a portion of the sale goes to help support KRL. If you are a dog lover who loves mysteries, Ears For Murder by Sue Owens Wright is the perfect book for you! 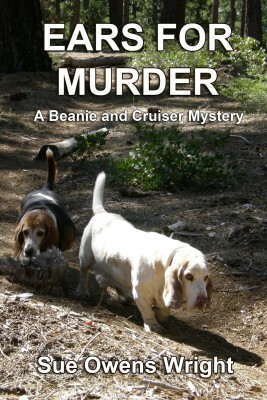 It is the fifth book in her series, featuring writer Elsie “Beanie” MacBean and her Basset Hound Cruiser. Beanie’s day is off to a bad start when a huge machine starts making a crazy amount of racket and she finds out that the 100-year-old Jeffrey Pines near her cabin in South Lake Tahoe are being ripped out. This destruction of nature by local developers brings pain to her Native American roots and to the ears of the Bassets (she is pet sitting her daughter’s Basset Calamity). Needing to get some fresh air, Beanie takes Cruiser and Calamity out on a walk and they come across a corpse wrapped around the base of a tree with an arrow sticking out of his neck. She immediately calls her friend Skip, who happens to be the local sheriff. Was this murder in protest of the clearing of the old trees, or was it personal? As she tries to figure out who the killer might be, Beanie meets some interesting characters, and thanks to Calamity running off on her she might even have found a bit of romance. There are some interesting twists and turns in the mystery part of this story, and it’s nice having an older heroine. The characters are delightful, and I love the Bassets and how they are actual characters in the story not just pets that Beanie happens to have. I also like the environmental side of the story. If you enjoy a good mystery, good characters, and dogs, don’t miss Ears For Murder! Be sure to check out the earlier books in the series as well. SUE: I’ve written since my teens (poetry) but started writing my first novel, The Secret of Bramble Hill, in the early 1990s, though it wouldn’t be published until 2017. SUE: Howling Bloody Murder, the first novel in the Beanie and Cruiser Mysteries, was my first book to be published and was released in 2001. In the first book, I introduce Native American Elsie “Beanie” MacBean and her Basset Hound, Cruiser. Land disputes at Lake Tahoe between developers and the Washoe turn deadly, and it’s up to Beanie to clear a Tribal Elder’s name. SUE: Mostly I write mysteries, but I’ve also written books on dog care, including 150 Activities for Bored Dogs, What’s Your Dog’s IQ? and People’s Guide to Dogs. I’ve also written numerous articles for various magazines and a pet care column, which have earned me two Maxwell Awards from the Dog Writers Association of America for the best writing on the subject of dogs. SUE: Lake Tahoe and basset hounds are dear to my heart. I’ve been visiting the lake since childhood, so it’s all very familiar to me. South Lake Tahoe is where the Beanie and Cruiser Mysteries are set. There are now five published books in the series, the latest of which is Ears for Murder. Elsie “Beanie” MacBean is the recurring main character, but Cruiser has a crazy new Basset sidekick named Calamity, who is always getting into trouble. She is a composite of my two most challenging rescued hounds. KRL: Why did you decide to feature Basset Hounds? SUE: In all the writing workshops I ever attended, the advice was to “write what you know,” which I found rather confusing. The instructors should have advised students to write about what you love. In my case, it was dogs ? Basset Hounds, in particular. I’ve had eight of them over the years, and those beloved companions have been my long-eared muses. My latest Bassets, Beau and Peaches, are featured on the cover of Ears for Murder. Beau left for Rainbow Bridge in 2015, so the book is dedicated to him. SUE: Both. First and foremost, I want readers to be entertained. Because the Beanie and Cruiser Mysteries are set at Lake Tahoe, environmental and social issues that impact the region find their way into my books. Animal welfare also figures largely in my work. Cruiser and Calamity were rescued, like my own dogs. 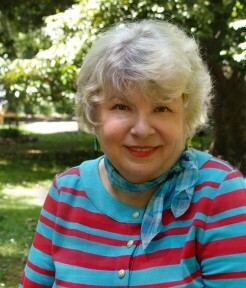 SUE: Afternoons at a local coffee/tea shop are what I call my Tea and Me Time, and that’s when I do most of my writing. I start out with a daily journal entry, which springboards me into other writing. Sometimes, I’ll write late at night when the house is quiet and the night owl in me starts hooting. SUE: I don’t outline in the old school sense of the word (I always hated that! ), but I sketch out my characters, plot points and chapters in lined school notebooks. Nothing is set in stone. I’m a bit of a pants-er. Things can and often do change as I get further into the story. Interesting new characters appear, twists and turns develop, and even the ending can alter. It’s an adventure for me, and for the reader too, I hope. SUE: I wish I could start writing first thing in the morning when I’m just coming out of the dream state and the day’s distractions haven’t descended upon me, but that never seems to work out. The dog needs feeding and walking, and the house isn’t quiet in the morning. Besides, I’m not early bird by nature and not much good until I’ve had my morning tea. SUE: I had poems and stories published before I ever wrote a book, but my dream since childhood was to write a mystery novel. My first book had a dozen or so rejections before it was accepted, which isn’t bad when you consider authors such as Ernest Hemingway had many more rejections than that before they were published. Rejections can sting but are part of being a writer, a rite of passage into publication. Just about everyone gets rejected in the beginning, but you can’t let that stop you. The best rejections come with comments and advice from the editor, which you should pay close attention to, especially if they invite you to resubmit. Then move on, keep writing, and get better at it. Next thing you know, you’ll be getting more acceptances than rejections. SUE: The best acceptance was for my first mystery in the Beanie and Cruiser Mystery series. My two Basset Hounds, Daisy and Bubba Gump, were in my office with me at the time I received the e-mail from the publisher. When I jumped up and howled for joy, they joined in the chorus. It was one of the happiest days of my life. SUE: That would be the first book signing I did at a Barnes & Noble bookstore in Sacramento. I had a Sherlock Holmes costume specially made for my Basset Hound, Bubba Gump, who was the inspiration for Cruiser in the Beanie and Cruiser Mysteries. My husband led Sherlock Bubba up and down the aisles of the store, which attracted patrons over to my table to hear me talk about my books. My pup publicist did a great job and I sold a lot of books that day. SUE: I have begun writing a sixth novel in the Beanie and Cruiser Mysteries. I’m also working on a couple of nonfiction books. SUE: William Wordsworth and other British poets. The Brontë sisters. Stephen King. SUE: In the course of writing the Beanie and Cruiser books, I’ve done quite a lot of research on Lake Tahoe and the Native Americans that are indigenous to the region. I have visited the Washoe Indian museum at Tallac Historic Site and read the few books that were written about their tribe. Environmental issues are always in the forefront at the lake, which invariably find their way into my series. I also did quite a lot of research for The Secret of Bramble Hill, which is set in post WWII England. I did have an advantage on that research, since I’m married to a Brit and know several people who lived through wartime Britain, including one who survived the London Blitz. One of Hitler’s bombs destroyed her family’s home. SUE: I have rather eclectic tastes in literature. I like to laugh, so I gravitate to humorists like Bill Bryson, Davy Barry and Jean Shepherd, but I love the classics and current works, like Hillbilly Elegy. Ray Bradbury’s writing is incomparable. I also like reading books by Anne LaMott. Mostly, I enjoy getting a good scare from Stephen King’s horror novels. He’s my all-time favorite. SUE: Gone with the Wind and Titanic are the best movies ever made, IMHO. I binge-watch Frasier and Law and Order, Special Victims Unit reruns from the 90s, the ones with hunky Christopher Meloni as Mariska Hargitay’s co-star. Oddly, I never watched the series in its heyday. SUE: The same as my best writing teacher advised, “Place seat of pants in seat of chair.” And never, ever give up. SUE: I would like to share with you some Cruiser Basset Hound wisdom, as it relates to writing and life, which has served me well: Follow where the path leads you and stay on track. Take time to sniff the roses, and leave your mark along the way. SUE: I’m also an artist and a musician. I paint pastels for fun, profit, and nonprofit (I donate my art to pet rescue fundraisers), and I play the harp, piano and ukulele, purely for enjoyment. To enter to win a copy of Ears For Murder, simply email KRL at krlcontests@gmail[dot]com by replacing the [dot] with a period, and with the subject line “ears,” or comment on this article. A winner will be chosen January 13, 2018. U.S. residents only. If entering via email please include your mailing address, and if via comment please include your email address. I thoroughly enjoyed this book review and interview. Being a dog lover myself, I just found a new series to read. 😀 I would love to win the book and get started on this series! I haven’t read any of the basset hound murders, but I love dogs and bet I would enjoy this book! Thanks. I’d love to read this! Thanks for the opportunity! I would love the chance to win. Thank you for the chance. Oh goodness, those dogs are adorable! I love mysteries with animals in them. Thank you for the chance to win this book! Love Bassett Hounds and I love the title “Ears For Murder”. Would enjoy reading the book. What adorable looking dogs and the book sounds really interesting, thanks for all the information! I’ve never read anything by this author and would like to give her a try! A great interview! Always interesting to learn the author’s insights on their books and how they write them. And I love books that include dogs.